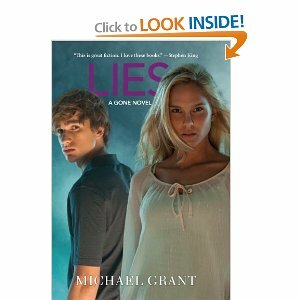 Lies: A Gone Novel is part of a series by Michael Grant. Book three takes more of a step into horror, rather than the original book in the series, which I would have described as dystopian fiction. It took me longer to get into this book. Almost a good third of the book had gone by, before I was sucked in enough that I couldn’t stop reading. I’m not sure about the change towards the horror genre. I am generally not a fan, although I’m sure it will still be a huge hit with middle school and high school readers. I can’t describe what phase I was in that had me reading every Stephen King novel that was written during that time, but I remember it well. Now you couldn’t pay me money to read one of King’s horror novels. It’s ironic (at least to me) that a Stephen King quote runs above the title on this novel. I was reading Hunger, the second Gone novel while my husband was reading King’s Under the Dome. The Dome on the cover of his novel certainly makes me think of what the FAYZ wall must look like.